So, you’ve been dreaming of doing it all – being the best mother, a doting wife, a home-based entrepreneur, and an excellent home school teacher – and everyone says you’re crazy. “It can’t be done,” they say, shaking their heads vehemently. Don’t give up hope. You can have it all – and without winding up a drooling, babbling loon hunched up in the corner of the room. Here are a few important steps to help you teach and work from home simultaneously. You’ve heard the old adage that it takes a village to raise a child. Well, it takes a community to support a home schooling, work-at-home mom. Seek out others who are in the same situation. They can provide you with valuable wisdom, time-tested solutions to problems, and, if required, a shoulder to weep on. Many cities and towns have support groups for home schooling parents and boast regular meetings. Some of these offer educational programs that your children can partake in with others – giving you some much-needed spare time. You can also choose from a plethora of home schooling communities online. There is no such thing as a SuperMom, no matter what your girlfriends tell you. Everyone needs a break – time to recharge the batteries – every now and then. All students – home schooled kids included – are required to do quiet deskwork from time to time. These moments can provide you with the opportunity to decompress and refuel. Some home school moms have a scheduled “fun time” once a week. Instead of adhering to the traditional classroom, you can take your kids on a field trip – mixing learning and fun. This not only refreshes your kids, but it also gives you a much-needed change of scenery. You should also schedule time for yourself and NOT feel guilty about it. Take an hour each day to read a book, watch a TV show, call a friend, or just sit by the window and vegetate. 3. Use the tools available to you. If you are planning on working from home plus home schooling, you will not have the time to plan an original curriculum. You must be realistic about this fact. You will need to follow a pre-planned curriculum and use existing resources. Search online for a curriculum fair near you. Gather as many online resources as possible (check out “YouTube’s Educational Channels Offer Wealth of Lessons” to get started). Check out your local teachers’ store for workbooks, education toys, and other classroom necessities. Ask your fellow home schooling parents for resource materials. Choose the curriculum that works best for you. Some programs require children to engage in more independent work than others. These would be a wise choice for a work-at-home mother. Try to blend education and real-life activities. 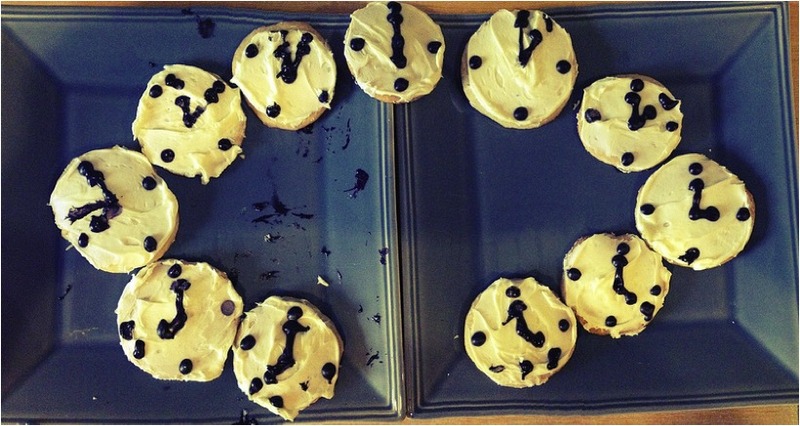 A baking project can be used to teach fractions – and take something off your “to do” list. Your child can learn to tell the time AND you can tick dessert off your list of chores. 4. Have a family routine. There is no reason for you to bear the burden of working, teaching, cooking, cleaning, and Heaven-knows-what-else all by yourself. It is important to create a schedule and to delegate responsibilities. Set aside time for teaching. This is the time that you will be engaging in actual instruction and available to respond to questions. Allot time for work. During this time, your children could be doing independent work. Or perhaps you wish to work during the evening or early morning hours, when your spouse is home. This is something you’ll have to decide based on your family’s needs. Remember to schedule “alone” time with your spouse. No matter how busy life gets, you must make your marriage a top priority. Enlist your children’s help with chores. Doing housework, yard maintenance, and cooking duties teach children valuable lessons about work ethic, cooperation, and responsibility. And it will ease your burden. Your spouse can help with the teaching, too. He or she is likely stronger in some subject areas than you are, so it makes sense that he or she should chip in. You can juggle running a business and schooling your children – all from the comfort of your own home. It won’t be the simplest endeavour, but it will likely be the most rewarding. What advice can you offer parents who want to work from home while home schooling their kiddies? Kimberley Laws is a freelance writer and English teacher.